microRNAs (miRNAs) are important regulatory factors for eukaryotic gene expression. More and more novel miRNA genes are being cloned in recent years. However, there is no evidence that all the miRNAs has been discovered, especially for the lowly expressed ones which are difficult to be discovered by conventional methods. High-throughput sequencing technology possesses ideal sequencing depth and can obtain millions or even tens of millions of small RNA sequence information during one reaction. Theoretically, lowly expressed miRNAs could be detected by high-throughput sequencing. However, an efficient algorithm is extremely important for the extraction of the new miRNA candicates from the huge seuqencing data sets. In previous study, we found the cleavage signals on the miRNA precossors, which were produced by Dicer in animal or DCL in plant, could be detected by degradome sequencing. Besides, their positions are highly correlated with the boundries of the miRNAs (-5p) /miRNAs*(-3p). In this regard, the cleavage signals detected by degradome sequencing can be employed as the markers to detect potential miRNA loci. 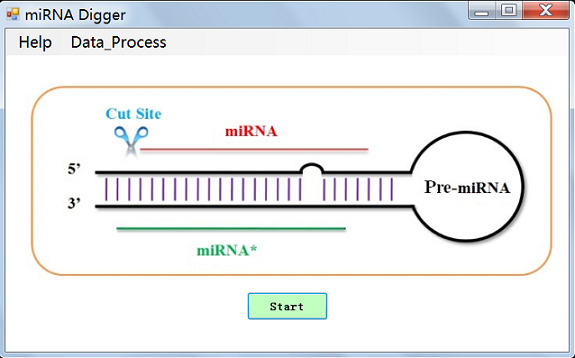 Based on this discorvery, we developed a pipeline, “miRNA Digger”, for large-scale identifiction of the new microRNA genes by screening the cleavage signals resided within the genome. It is a standalone biosoftware developed in C# and can be ran in Windows System (Vista, Win7 or versions above). "RNAfold.exe" has been integrated in the pipeline to predict second structures of the premiRNA candidates. As the degradome match is a time-consuming work, several weeks are required to complete a single chromosome scanning. If the computer is unfortunately power off before the work is done, “miRNA Digger” can continue the unfinished task when it restarts. The pipeline provides a new apprach for miRNA identification. Enjoy it. Huzhou University, China. Since 2015.